Bring class and charm to your desk or office area with these solid marble bookends with gold plated brass medical accents. Perfect for anyone in the medical field. Measuring 6 inches H. A great item for any professional. Marble pattern may vary. Ships in 3-4 business days. 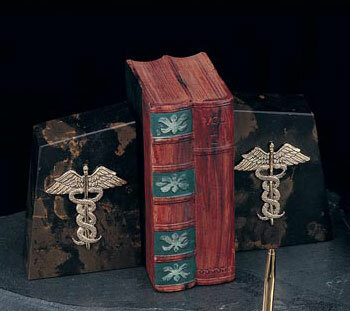 Bring class and charm to your desk or office area with these solid marble bookends with gold plated brass medical accents. Perfect for anyone in the medical field. Measuring 6 inches H. A great item for any professional. Marble pattern may vary.